Using LEGO Technic gears and rods seems like a great way of bringing animation to your regular LEGO creation. Using gears and crank shafts you can animate models from your favorite TV show or movie like LEGO kinetic sculpture maker, [Josh DaVid] has done when he created a spinning TARDIS. Crank the handle and the sculpture spins through space and time. The large gear stays in place. The hidden gears, turned by the crank, rotate a shaft from below that goes through the large gear making the TARDIS rotate around the main axis. Connected to the TARDIS model is a smaller gear, at an angle, that meshes with the larger, stationary, gear. This smaller gear is what causes the TARDIS to rotate around its own axis while the whole thing rotates around the main axis. If your hand gets too tired, you can substitute a LEGO motor. We all know how important it is to achieve balance in life, or at least so the self-help industry tells us. How exactly to achieve balance is generally left as an exercise to the individual, however, with varying results. But what about our machines? Will there come a day when artificial intelligences and their robotic bodies become so stressed that they too will search for an elusive and ill-defined sense of balance? We kid, but only a little; who knows what the future field of machine psychology will discover? Until then, this kinetic sculpture that achieves literal balance might hold lessons for human and machine alike. Dubbed In Medio Stat Virtus, or “In the middle stands virtue,” [Astrid Kraniger]’s kinetic sculpture explores how a simple system can find a stable equilibrium with machine learning. The task seems easy: keep a ball centered on a track suspended by two cables. The length of the cables is varied by stepper motors, while the position of the ball is detected by the difference in weight between the two cables using load cells scavenged from luggage scales. The motors raise and lower each side to even out the forces on each, eventually achieving balance. The twist here is that rather than a simple PID loop or another control algorithm, [Astrid] chose to apply machine learning to the problem using the Q-Behave library. The system detects when the difference between the two weights is decreasing and “rewards” the algorithm so that it learns what is required of it. The result is a system that gently settles into equilibrium. Check out the video below; it’s strangely soothing. We’ve seen self-balancing systems before, from ball-balancing Stewart platforms to Segway-like two-wheel balancers. One wonders if machine learning could be applied to these systems as well. 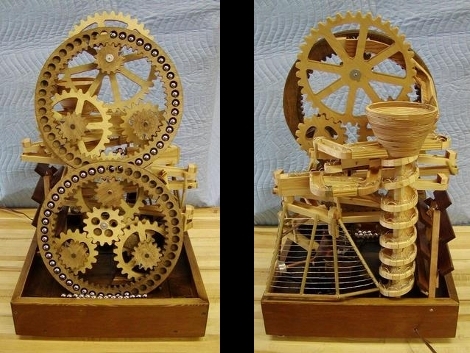 Most modern automata are hand-cranked kinetic sculptures typically made from wood, and [videohead118] was inspired by a video of one simulating a wave pattern from a drop of liquid. As a result, they made a 3D printed version of their own and shared the files on Thingiverse. In this piece, a hand crank turns a bunch of cams that raise and lower a series of rings in a simulated wave pattern, apparently in response to the motion of a sphere on a central shaft. The original (shown in the animation to the right) was made from wood by a fellow named [Dean O’Callaghan], and a video of it in its entirety is embedded below the break. [Martin], of the YouTube channel [WinterGatan], recently uploaded a video tour of the Phonoliszt Violina, an orchestrion, or a machine that plays music that sounds as though an orchestra is playing. The interesting thing about this one is that it plays the violin. At the time of its construction, people weren’t even certain such a thing would be possible and so when [Ludwig Hupfeld] first built one around 1910, it was considered the eighth wonder of the world. The particular one shown in the video is at the Speelklok Museum in Utrecht, the Netherlands. The bow is a rotating cylinder with 1300 horsehairs. To get the sound of a single violin, it actually uses three of them. Rather than the bow being moved to press against the strings, the violins tilt forward to make their strings contact the rotating bow. Only one string is used per violin, hence the reason that three violins are needed. The volume is controlled by making the bow rotate faster for more volume, and slower for less. Mechanical fingers press against the strings with cork to more closely imitate the human fingertip. The machine consists of both the mechanical violin and piano under the guidance of two paper rolls, with one roll playing at a time. See and hear it in action in the video below. There are robots that will vacuum your house, mow your lawn, and keep their unblinking electronic eyes on you at all times while hovering hundreds of feet in the air. How about a robot that plays a violin? That’s what [Seth Goldstein] built. He calls it a ‘kinetic sculpture’, but there more than enough electronics and mechatronics to keep even the most discerning tinkerer interested. There are three main parts of [Seth]’s violin-playing kinetic sculpture. The first is a bow carriage that draws the bow across the strings using an electromagnet to press the bow against the strings. The individual strings are fingered with four rubber disks, and a tilting mechanism rotates the violin so the desired string is always underneath the bow and mechanical fingers. As far as software goes, the Ro-Bow transforms MIDI files into robotic mechanization that make the violin sing. From what we can tell, it’s not quite as good as a human player; only one string at a time can be played. It is, however, great at what it does and is an amazing mechanical sculpture. This is one piece I regret to have missed this year at Burning Man, however I certainly heard tales from any one who stumbled across it. [Christopher Shardt]’s Garden of Rockets consists of three kinetic fire art pieces with spinning propane rockets that you can control! [Christopher] decided to incorporate his Burning Man 2010 project, 4pyre², which is a 12 foot pipe with opposing propane fueled rockets on each end. Onlookers can control the amount of propane fed to the rockets and twist the pipe they are attached to causing the whole thing to spin around like an out of control fire hose. Accompanying 4pyre² is PyreGoRound, and Pyroticulation which are two variants on 4pyre²’s concept of spinning rocket bars. 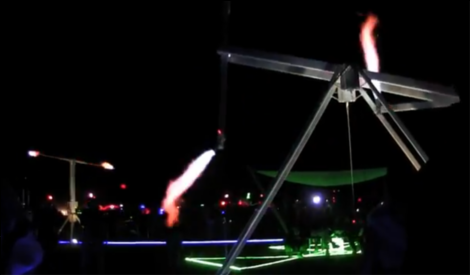 [Christopher] was lucky enough to have his project materials funded by Burning Man, but added three thousand dollars (!) in propane to the mix out of pocket. Check out a video of the project after the jump, and [Christopher]’s site for details and schematics. This kinetic sculpture is a ball bearing’s paradise. Not only do they get a cushy ride around two lift wheels but there’s a variety of enjoyable obstacles they can go down. The first is a vortex made from a wooden flower pot which sends the balls randomly down one of two possible exits. From there it’s on to enjoy a ride on a flip-flop, a divide-by-three (takes weight of three marbles before it dumps them all), a zig-zag track, or a divide by twelve mechanism. We’re sure this is a riveting read, but don’t miss the video after the break where [Ronald Walter] shows it in action and takes it apart to illustrate the various features. If you’re wondering about the digital logic terms used, we’ve seen wooden devices that use these concepts in the past.